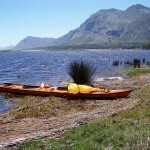 the bird sanctuary, that is located where the river enters the vlei, harbours more species of birds than any other place in the southern region of South Africa (according to the SA Venues website). 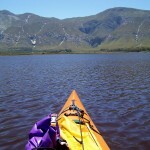 Deon and I didn’t know this when we paddled from the mouth to Stanford (almost) and back, a distance of over 30km. We do know, however, that we criss-crossed the bird sanctuary for quite a while and distance trying to find the main channel, as you can see from the Google Maps paddling track. The relatively high water level means that there are now plenty of false channels and an expanded delta – a water labyrinth in reality. The experience of two previous trips up and down the river seems to have taught us little. We were also trying out a different sail design, which may have contributed to our aimless meandering (the previous one was lost off Rooiels is a stiff south-easter when a line parted and its design made de-rigging from the cockpit impossible). 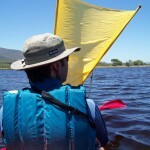 This sail is simpler and easier to stow but doesn’t reach well and seems to be a little unstable when the wind freshens. But at least it propelled us upriver at a steady 4-6 km/h in a moderate breeze from astern. We spent a pleasant and tranquil few hours hearing only the swish of our paddles, the contented honks of the geese and ducks and the hiss of the breeze in the reeds . The 10-km haul from the river down the lagoon back to the launch site, into the breeze, proved to be a bit of an endurance test, however, to which stiff shoulders and aching muscles can attest.